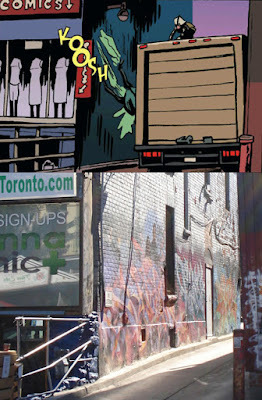 Sticky Footprints: Sticky Step Thirty: Dr. Comics (now closed)/CannaClinic - 44 Kensington Ave.
Sticky Step Thirty: Dr. Comics (now closed)/CannaClinic - 44 Kensington Ave.
Now down to a single opponent after dropping off the second deadly Viking Beetle outside of Seven Lives Tacos y Mariscos in Kensington Market, the Human-Lizard easily dispatches the last of the anthropomorphic insect renegades over side of the cube van they're traveling on as it makes a sharp right turn down the alleyway next to Dr. Comics at 44 Kensington Ave. The Human-Lizard makes a squeeze play to victory. Finally, the Human-Lizard is free to meet up with his date, but there's just one problem. It's a tight alleyway already and with man-sized crushed bug guts jamming up what little space is left, it's the end of the line for this rushed delivery driver as he leaps out of the truck's cab to give the Human-Lizard a piece of his mind. 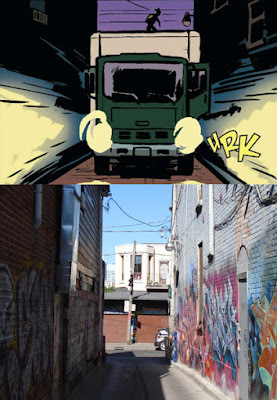 A tight spot in the alleyway next to 44 Kensington Ave. Originally known in the neighbourhood as Kensington Comics, Dr. Comics took over the space at 44 Kensington Ave. for several years before closing down, moving out and being replaced by CannaClinic, one of the many of medicinal marijuana dispensaries that have recently popped up in the city. If you're still jonesing for comics, though, not to worry. Although they may have left Toronto and Kensington Market behind them, you can still get your four-colour fix from Dr. Comics in the heart of cottage country at 79 Mississaga St. E. in Orillia. Next up: Lucas makes tracks up Augusta Ave. past Coalition and the balanced rock art of Sunjye as he tries not to be late for his date! The Toronto area urban exploration photoblog with a sauro-mammalian twist! Retrace your steps . . .
All photos © DEVL Design (unless otherwise noted). Pitiful Human-Lizard is © Jason Loo. Travel theme. Powered by Blogger.